Mules N' Honey: Waterpark and a Nake! 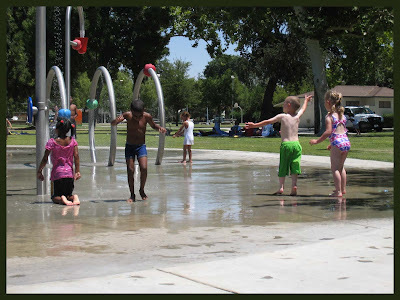 See these kids at the spray park? Mine are the pasty ones. This was a stressful even for me in which I didn't get to socialize much. Kids in public areas with no fences and streets kind of ruin any potential social interaction. This was AFTER we went to Dewar's ice-cream shop for a tour. THAT was a great trip, except for Ed. Ed was NOT fun yesterday. I'm surprised his arm is still attached to his body. I wouldn't let go of his hand, and he kept throwing himself down on the ground, and trying to pull away. Punk. The ice-cream was excellent, and the candy was great. Jocelyn and her kids went, too. It was fun. Except for Ed. Today after lunch I kicked the boys outside, and I followed a minute later with laundry to be done. I hear "Nake, mommy, nake!" and go find Ed. He is at the end of our trailer, and when I ask him where the snake is (cuz I don't see it...) he says "Nake mommy. See? Oh, Mater." and picks up his toy he dropped. We walk between our trailer and the semi trailer we use for storage, and there at the other end is a snake. I grab my camera, which was nearby because I was getting ready to take pictures of the house. (Maybe tomorrow...) I took video og the thing, see the sidebar link if you are interested. This is the fourth snake we've seen on our property. The first by me. Probably not the last. 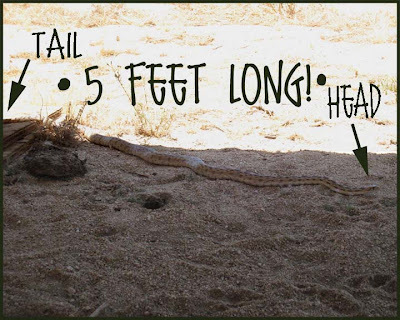 Your good - snakes are my kryptonite and I would have moved out after the first sighting!!! I know what you mean about socializing. With a 4 and 2 year old I spend more time running around yelling their names then standing still. Owell... one of these days!! I love that video. Ed was so cute sneaking up on the nake. And then Kacy pulled him back. What a good big sister. I'm horrible with my I-guess-someone-will-let-me-know-if-they're-dead approach to motherhood. I'm not a hoverer, if you don't stay out of the street I guess you deserve to get hit, because I've told you 1 million times to stay away from it. I'm also the one who says "If you had just listened to me then you wouldn't be hurt right now!" My kids get 0 sympathy. OOOH now I sound so callous. I really do love them, I swear! Im with Syndy. If I tell my kids not to do something because it will hurt and they do it anyway and get hurt I really dont fell for them. They do listen most of the time. I LOVE DEWARS. I havent had thier candy for along time. I guess its time to order some. Maybe after the move next week. I wish we had a waterpark here! Nothing to do here...very boring at times, and very hot all the time! !